Corps lined up for the finale of the DCI World Championship Finals on Saturday, Aug. 18, 1979. 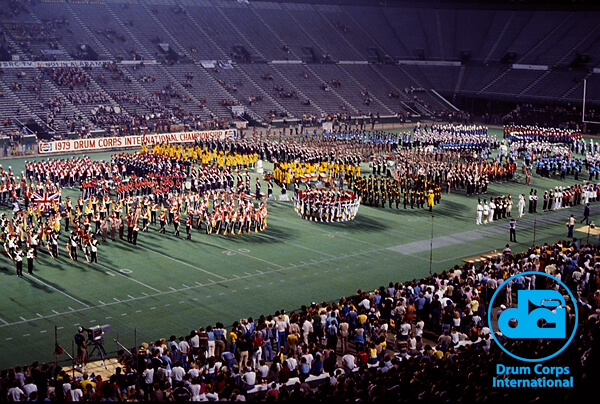 1979 marked the first of two years that the DCI World Championships headed to Birmingham, Ala.'s Legion Field, the southernmost locale to host the series until Miami, Fla. four years later. 1979 also marked the first of two years in a row that the Blue Devils took home the Championship trophy, doing so in '79 with a program that was made up of Stan Kenton's "Chicago III Suite," "La Suerte de Los Tontos," and "My Heart Belongs to Me," a popular tune made famous by Barbra Streisand. Other finalists corps included Phantom Regiment, Santa Clara Vanguard, Spirit of Atlanta, 27th Lancers, Bridgemen, Guardsmen, Madison Scouts, North Star, Blue Stars, Cavaliers and Troopers. 1979 was the first time in several years that fans saw the Troopers back in DCI's main event, after the corps finished in 20th place both in 1977 and 1978.